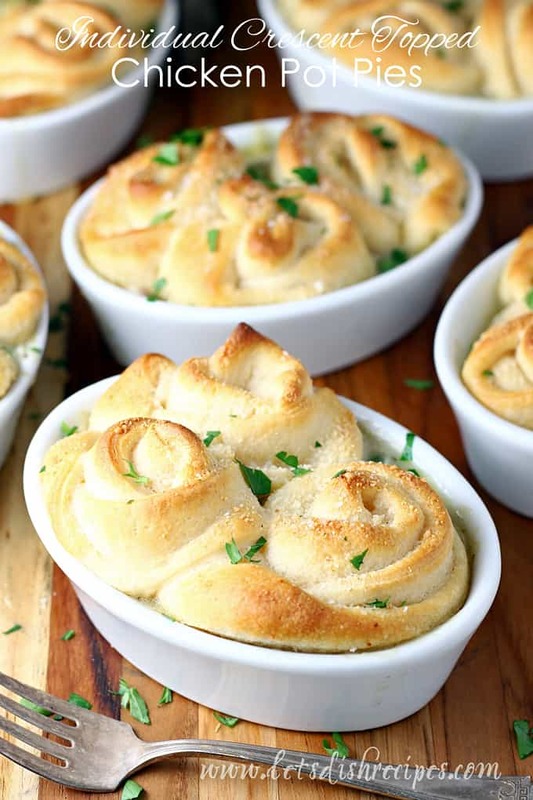 CRESCENT TOPPED CHICKEN POT PIES — Chicken and vegetables in a creamy sauce, topped with crescent roll dough and baked until golden and bubbly. 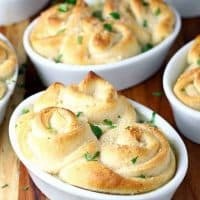 I love chicken pot pie in all it’s forms, but these individual Crescent Topped Chicken Pot Pies are one of my favorite versions of the classic pot pie. There’s something about having your own little pot pie that’s just fun! And when your individual pie is topped with flaky crescent roll dough, arranged in pretty pinwheels, somehow the whole meal tastes better. 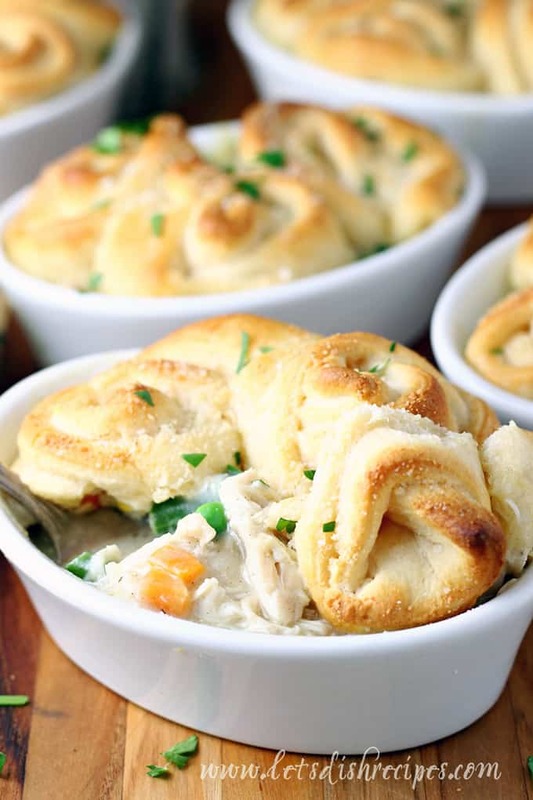 Whether you’re feeding kids or grown ups, these mini pot pies are a hit with everyone. And it’s a great way to sneak in those vegetables for the picky eaters in your family. 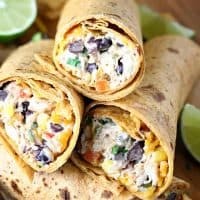 To make this dish extra easy to prepare, I like to use a supermarket rotisserie chicken, frozen mixed vegetables, and of course, canned crescent roll dough. I like to use the dough sheets in this recipe, because it’s easy to cut them into strips and arrange them over the individual pies. But these pot pies could just as easily be made from scratch if you have the time and energy. Either way, they’re going to be delicious! Don’t be surprised if the whole family raves! I do like to add some cooked, diced potatoes if I have a little extra time, but when I’m really in a hurry to get dinner on the table, I just toss in a bag of frozen veggies and call it good! And of course, you could put everything into one larger dish if you don’t have any individual dishes available. It still tastes the same! 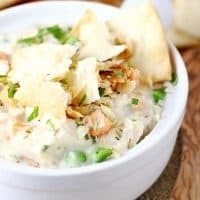 Like I said, I never get tired of eating chicken pot pie in any form, and if you’re looking for a new twist on a classic comfort food dish, this recipe is a must try! Be sure to save this recipe for Crescent Topped Chicken Pot Pies to your favorite Pinterest board for later. 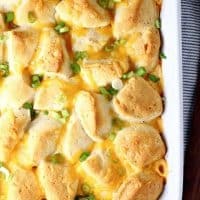 Chicken and vegetables in a creamy sauce, topped with crescent roll dough and baked until golden and bubbly. Preheat oven to 400 degrees. 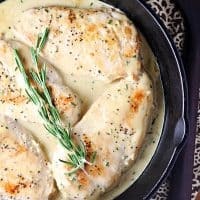 In a large skillet, heat butter over medium heat. Add garlic and onion and cook until soft, about 3 minutes. Stir in flour and cook a few minutes more. Slowly whisk in chicken broth until smooth. Whisk in milk, salt, pepper, thyme and sage. Bring to a simmer, stirring constantly, until mixture is thickened. Stir in chicken and frozen vegetables. 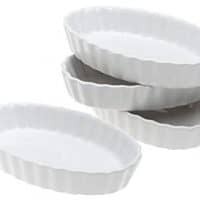 Divide the mixture among 6-8 lightly greased individual baking dishes or ramekins. Unroll the crescent dough and cut each sheet into 12 strips. 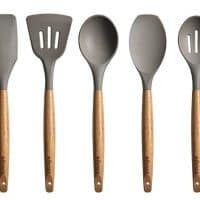 Arrange 3-4 strips, in a pinwheel fashion, on top of each pot pie. You may not use all the dough. I just bake the extras on a small baking sheet and serve them on the side. Sprinkle the pot pies with Parmesan cheese and garlic salt. Bake for about 15 minutes, or until filling is bubbly and crust is golden. Sprinkle with fresh parsley before serving if desired. Yum! 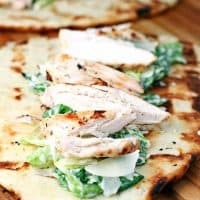 Love the idea of using crescent dough — I’ve never been a huge fan of the traditional pie crust on pot pies to be honest. These are adorable, and I love that you can use frozen veggies. Pinning it! Thanks, Danelle!